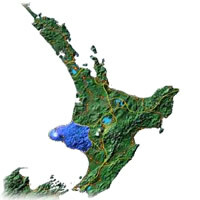 The Taranaki region is mid way between Auckland and Wellington, facing the Tasman Sea on the West coast. This is ideal for outdoors sports and surfing. Skiing is also possible on Mount Egmont/Taranaki known as either Mount Egmont or Mount Taranaki located in Egmont National Park. Other activities include rafting, kayaking, golf, hiking, and swimming. Taranaki offers an alpine and national park wonderland, rolling green fields, a beautiful coast and enough Maori and colonial history to fill a library. Enjoy the great outdoors with mountain to sea experiences and everything in between. KINA is a boutique design store,art gallery & on-line shop proudly supporting New Zealand/Aotearoa designers, craftspeople & artists. This is the perfect place to shop if you are looking for a distinctive slice of New Zealand made art and design. KINA is a destination for affordable gifts which express the enviable Kiwi individual spirit and style from jewellery, ceramics, sculpture, glass & more. White water sledge over a 30 foot spillway. Maori history, sledge around an old Maori Pa 'fortification'. Okahutiti Pa - The birthplace of the prophet Tohu Kakahi. "Excellent, professional and safe, well thought out, positive Maori aspect" - Harry UK. Run Times 9am, 12noon, and 3.30 pm 7 days a week. A three-day get-away of moderate walking (45kms over 3 days) in the Eastern Taranaki Backcountry. Enjoy NZ native bush at its best in remote location and great farm and country hotel hospitality. Inclusive of all meals, transport, accommodation, 3 nights (linen bed). Starts from and returns to Stratford. Complimentary public transport pickup available. 2-5 people $450nz pp 6-10 people $420nz pp.